Intestate distribution is the default distribution of a decedent's estate determined by state law when there is no will or will substitute or when there is property that is not covered by a will. Issue are any descendants, including children, grandchildren, and so on. Ascendants are any ancestors, including parents, grandparents, and so on. The surviving spouse generally receives most or all the predeceased spouse's property under intestacy. A tier is the class of all relatives of a generation that have the same relationship to the decedent and who have either survived the decedent or have surviving issue. 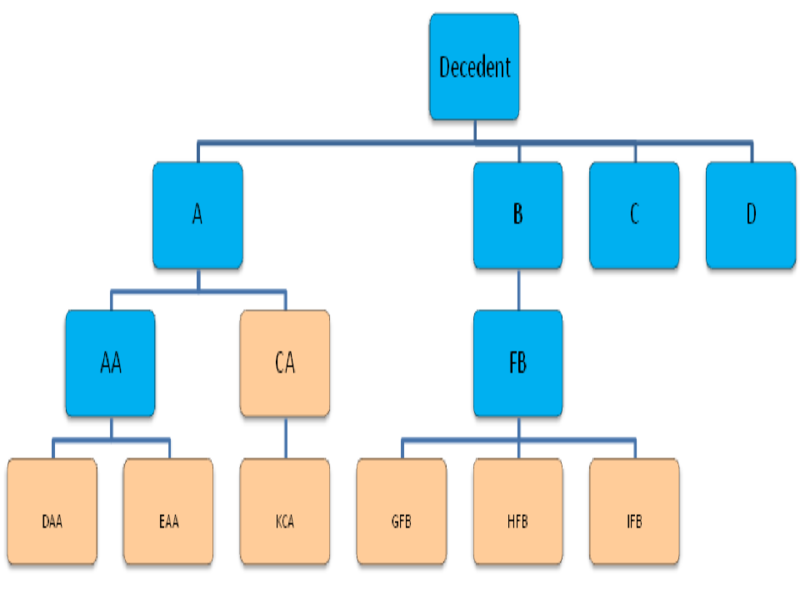 All descending tiers rank above ascending tiers (example: children inherit before parents). Under the strict per stirpes distribution, used by about 1/3 of the states, the estate is 1st divided into equal portions by the number of members in the 1st tier. Living members take their share; the portions that would have gone to the dead members of the tier are dropped by bloodline and shared by the issue of the deceased. Under the per capita with representation distribution, used by about ½ of the states, the estate is divided by the number of people in the highest tier where there is a live taker. The live takers take their portion, and the portion allotted to the dead members of the tier are shared by their issue, just as under the per stirpes distribution. Under the per capita at each generation distribution, used by about 12 states, the estate is divided just as in per capita with representation, but any part of the estate that drops to the next generation is first pooled, then divided equally amongst the members of that generation. The advantage of this distribution is that each live member of a given generation receives equal portions of the estate. When a decedent leaves no will, his property is distributed according to the state's intestacy law. The laws of intestacy vary greatly among the states. The applicable state law would be for the state in which the decedent was last domiciled. If the decedent had real property in other states, then the laws in those states would be controlling for the intestate distribution of that property. The general rationale to most of these laws is that the closer the relationship, the more likely they will take. The surviving spouse generally receives the major portion or all the property. If there is no surviving spouse, then the property goes to the issue of the decedent and if there is no issue, then to ascendants or issue of ascendants of the decedent. In most cases, the ascendants that are usually still alive are the parents and the issue of the parents, which would be the decedent's brothers and sisters and any of their descendants. Other than the surviving spouse, the remaining relatives are grouped in tiers of equal relationship to the decedent who have either survived the decedent or have surviving issue. descendants are always first in line to receive before any ascendants or their issue, so if there are any descendants, then the ascendants get nothing. Generally, a spouse has a duty to care for the other spouse. Hence, under most intestacy laws, the spouse receives most or all the predeceased spouse's share of the property, especially if the estate is small. This is true even if the couple has children. The rationale for this distribution is that since the children are children of both parents, the surviving spouse will do what's in the best interest of the children, and that the last spouse will provide for all their children after her death or they will inherit under intestacy. Under the Uniform Probate Code (UPC §§2-102 to 2-105), the surviving spouse generally receives even more than she would under the laws of most states. However, if the decedent had surviving issue who is not also issue of the surviving spouse, then the surviving issue will usually receive some property, so that the surviving spouse cannot favor her own offspring at the expense of the predeceased spouse's other issue. What property remains after the share of the surviving spouse, or if there is no surviving spouse, is distributed to the nearest tier where there is a live taker. Most laws attempt to distribute the property equally within a tier. However, there are 3 different methods of distributing property beyond the surviving spouse: per stirpes, per capita with representation, and per capita at each generation. Generally, the remaining estate is divided by the number of lines of descent that take, whether it is a member or his issue that takes. However, when someone in a given line of descent takes, then no one below in that same bloodline takes. So if someone takes, then nothing goes to their children or grandchildren. At which tier are the members counted by which the estate will be divided. After the estate is divided, then under all 3 schemes, one share is allotted to each living member or to the issue of the dead members. How the shares drop to the issue of deceased members. Under the per stirpes distribution (aka strict per stirpes, also called English per stirpes because it was derived from old English law), the estate is divided by the number of members of the 1st generation, who are either alive or are survived by issue. Each member who is alive takes that share, and the shares of the deceased members drop to the next generation. This process is repeated for that generation. The share that drops is divided by the number of members in that bloodline who are either alive or are survived by issue. This process continues until all the share is taken. The per capita with representation (aka modern per stirpes, American per stirpes) works exactly like the strict per stirpes approach, except that the estate is divided equally at the tier that has a live taker. The estate is then divided by the number of lines of descent at that tier. The deceased members of that tier are represented by their surviving issue, hence, the name "with representation." A major drawback to the per stirpes and the per capita with representation distributions is that descendants who are equally related to the decedent may take unequal shares of the estate. The per capita at each generation distribution allows each member of a generation who takes to receive the same amount by pooling whatever drops to a lower generation, then dividing the pool among members of the same generation who are either alive or have surviving issue. The process is repeated if necessary until the entire estate is distributed. Shares are always divided at each generation by the number of members who are either alive or survived by issue. The estate is 1st divided by the number of members in the 1st generation who either survived the decedent or are survived by issue. Because both C and D are deceased and have no surviving issue, they are not counted in dividing the estate. Hence, the estate is divided by 2. $60,000 each goes to A and B, but since they are both deceased, the money drops by bloodline to the next generation. Since A had 2 children but only 1, CA, has survived, CA receives half of $60,000 and the 2 children split the $30,000 that would have otherwise gone to AA, had he survived. Since both B and FB died, only the 3 grandchildren of B survive, so they split the $60,000 that B would have received had she survived, with equal portions, $20,000, going to each grandchild. Note that under the per stirpes distribution scheme, each grandchild of B receives $5,000 more than the grandchildren of A, even though they all have the same degree of kinship to the decedent. Instead of the estate being divided equally among the members of the 1st generation, whether they are alive or dead but survived by issue, the estate is divided amongst the members of the 1st generation where there is at least 1 live taker, which in this case, is at the 2nd generation, and, thus, the estate is divided by 3, since there were originally 3 members to this tier. The only living member of the 2nd generation, CA, takes 1/3 of the estate, $40,000. DAA and EAA split their 1/3, so each gets 1/6 of the estate (1/3 × 1/2), or $20,000 apiece. GFB, HFB, and IFB share the $40,000 that FB would have received had she survived, so each one gets 1/9 of the estate (1/3 × 1/3), or $13,333.33. KCA gets nothing since her parent took. Note that, even though all the survivors, except CA, are great-grandchildren of the decedent, the grandchildren of A get more than the grandchildren of B under the per capita with representation ($20,000 > $13,333.33) and less under the per stirpes distribution ($15,000 < $20,000). To remedy this, the money is 1st divided where there is a live taker, which is the 2nd generation, just as it would be for per capita with representation. Hence, CA still takes his $40,000, but the remaining $80,000 is pooled, then divided equally by the next generation. Since there are 5 great-grandchildren of the decedent where no one above their line has took, they each take 1/5 of $80,000, or $16,000. Note that under all distribution schemes, KCA takes nothing because her parent is still alive and is more closely related to the decedent, and, thus, CA takes instead of KCA.